If you missed the first interview from Kristy’s Lovely Lathers, catch up here. Now, back to Kristy and her fabulous soaps! Anne-Marie: What’s your favorite soap to make? Kristy: I would say it would be the floral musk that will be coming up on Etsy soon. It looks like a birthday cake, lol. Anne-Marie: What type of things do you outsource? Or is it a one woman operation? Kristy: I’m a one woman show. Anne-Marie: What is the best advice you can give to someone who dreams about starting their own business? Kristy: Test, test, test. People can get hurt if you don’t test your soaps long enough or do enough research on it before selling. Also, don’t expect people to handout everything to you, you learn more by doing things yourself. 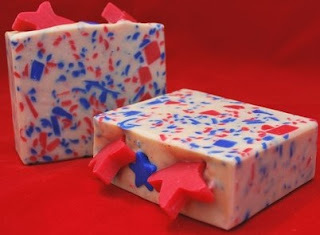 I made a lot of soap before I got it right. I had a lot of wonderful people on the forums help me with questions, but I had to learn things on my own too. Start out slow, not gung ho. You can go overboard and buy too many things you will end up selling later because you didn’t use it. Then you lose money. Anne-Marie: What’s your favorite Bramble Berry product? Kristy: I would say my favorite product is the Lavender Chamomile Huggies Fragrance Oil, which I wish were in smaller batches. I also love the Oatmeal, Milk and Honey and Cherry Almond fragrance oils. They are the best! Omg, and the Chocolate Espresso! I love making tarts with this. Anne-Marie: Anything we missed? Is there anything else you want Soap Queen reader’s to know about you? Kristy: I always like to try to make something once. It might take me a while to get it right but once I do, I’m happy. I like to make liquid soap for our personal use and family members. I like to make transparent soap too. I have a tutorial on Miller’s Soap website for transparent soap if anyone wants to try it. It’s very rewarding to make soap you can actually see through. Don’t’ let the alcohol scare you. I also make lotion, lotion bars, and lip balms. Anne-Marie: Thanks for chatting with us, Kristy! Be sure to check out Kristy’s Lovely Lathers and see the cuteness factor for yourself. 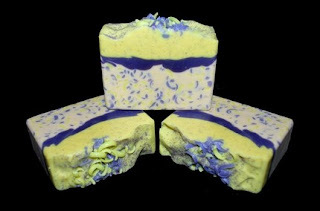 The Ocean Waves soap is gorgeous! Good Job! All her soaps are incredible! I'm so inspired by her and her success! I prob started dabbling in soap-making around the same time, but I've definitely not gone even 1/100 as far as she has. Kudos to Kristy!! I cant beleive I missed this interview! 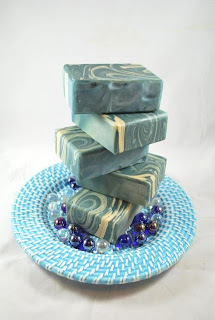 Her soaps are not only works of art, but they are truly the best soaps I have ever used!